Get the latest & updated list of Top Journalism Colleges in Bangalore 2019. The best mass communication institutes in Bangalore are known for their relevant courses of study and model curriculum that combines classroom learning and practical experience. These colleges also maintain collaborations with many national and international institutes and universities and is known for its placement opportunities. Find all the information you may need about these college's right from admission to placement. 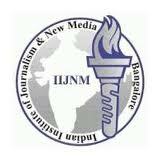 Indian Institute of Journalism and New Media (IIJNM) is a journalism school in India that offers quality education in the field of Journalism.